The R2 Indoor 1080P FHD Wireless Plug and Play IP Camera is Foscam’s latest entry in the DIY security sphere. The $150 camera is exceptionally strong on security, but its complicated setup undermines its plug-and-play promise, and it’s hard to imagine anyone setting it up at home without at least one call to customer service. The Foscam R2 sports a retro-futurist look that evokes a cross between Robby the Robot and R2D2—and, honestly, the fact that it’s named “R2” does nothing to dispel that impression. It’s available in black or white and comes with a removable Wi-Fi antenna, mounting bracket, and power adapter. The camera has a 110-degree viewing angle and streams in up to 1080p HD. A ring of 11 infrared LEDs around the lens provide up to 24 feet of night vision, and a built-in mic allows two way-audio. But the camera’s standout feature is remote pan and tilt: A motorized mount lets you change the camera’s direction vertically and horizontally from the app or web portal. This allows you to get a better view of something or follow a moving object as you watch the live feed—a handy feature whether you’re monitoring pets or potential intruders. Motorized pan-and-tilt sets Foscam’s R2 apart from many similarly priced Wi-Fi security cameras. The R2 also boasts motion and sound detection, and the former can be enabled to trigger recording of images or video. Recordings can be saved locally to a microSD card or hard drive or to the cloud via subscription. Doubling down on video storage is always smart, as that redundancy can preserve surveillance footage if an Internet outage cuts you off from the cloud or a burglar steals your camera along with your valuables. There’s no protection in the event of an electrical blackout, though; the R2 doesn’t come with a backup battery. The camera comes with two optional cloud storage plans. For $4 per month or $40 per year you get access to the past seven days of alert video footage. You can extend that to 30 days of video for $10 per month or $100 per year. A free trial is included with purchase. The Foscam R2 is advertised as plug-and-play but it’s anything but. Shortly after plugging it in, a disembodied female voice intones “ready for Wi-Fi configuration.” To add the camera to your network, you’re prompted by the accompanying app—there are at least a half-dozen Foscam apps in the iOS app store, but you must make sure you download the one described in the installation guide—to scan the QR code on the bottom of the camera. A 360-degree virtual dial lets you pan and tilt the camera incrementally. This is no easy feat. Because the code is on the bottom, you must hold the camera perfectly steady in your hand for the scanner to read it. Getting the QR code in exactly the right position and holding it perfectly still is a chore, and the scanning is complicated by a bar code directly below the QR code that you’re instructed to keep out of the frame. After 15 frustrating minutes of this balancing act, I gave up and opted to manually enter the UID. After the camera is added to your network, you need to create a name and login for the camera to access the R2’s app controls. Once I got through the arduous setup process, though, the camera impressed. Image quality was crisp in both regular and night-vision modes—there are controls to adjust color and image resolution if you want to fine-tune it—and audio was clear and clean. 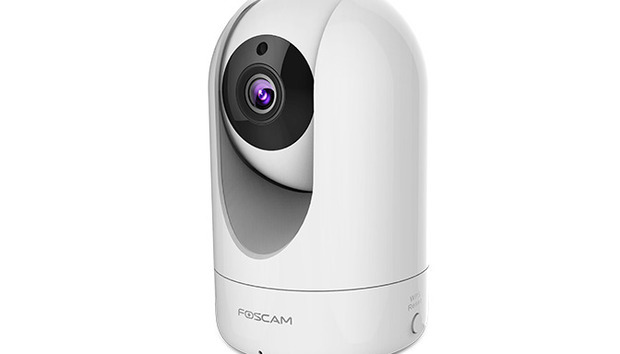 The R2 can be accessed and controlled from both the mobile app and the Foscam web portal. Both are pretty intuitive and include tools for managing audio, taking screenshots and manually recording video, turning night vision on and off, adjusting video quality, and controlling the camera’s pan-and-tilt feature. A range of camera settings can be accessed from each, including the scheduling and sensitivity settings for sound and motion detection and scheduling for night vision. The R2 records video locally to a microSD card as well as to optional cloud storage. Despite these customization options, which can help you curb false alerts by reducing the sensitivity of the camera’s sound and motion sensors or restricting monitoring to certain times of day, I found the out-of-the box settings to be just right. Motion detection was keen enough to alert me when a body—human or animal—passed in front of the lens, but it didn't overreact to changes in light or other trivial movement. Sound detection was also good enough to respond to the cat knocking something over upstairs, even thought the camera was set up downstairs. The pan-and-tilt feature is particularly cool. Both the app and web portal offer a few methods of using this feature. You can choose from presets to have it turn all the way up, down, left or right; click a “cruise” button to have it perform an up-and-down sweep at its current angle; or use a 360-degree virtual dial to move it in increments. This makes it incredibly easy to surveil a moving pet or just search a room for the cause of a sound alert. In a worst-case scenario, you could even tail an intruder, rather than wait for him or her to walk in front of the camera, and improve your chances of identifying them. The Foscam R2 offers serious surveillance with intuitive, easy-to-use apps. It may lack buzz features like facial recognition and personalized security settings, but I’ll take the pan-and-tilt feature and accurate alerts over those often-buggy options any day. The only knock is the challenging setup process, but as long as you know that it might not be as turnkey as advertised, you won’t be disappointed.